Que o tempo anda meio desorientado já todas nós sabemos. Que anda a chover que se farta também. Esta instabilidade toda deixa-me com mau feitio. Não gosto nada de chuva. Primeiro sou tão despistada e cada vez que saio à rua com um chapéu de chuva é certinho que o perco ou o deixo em algum lado que vou ter de voltar para ir buscar (ainda ontem perdi um) depois é impossível planear o que vestir mesmo que se vá ao site da meteorologia no dia anterior. Ando com o meu armário meio de Primavera, meio de Inverno, ou seja, uma confusão. Bem tento ir arrumando algumas peças mais quentes, casacos e botas e começar a colocar coisas mais frescas mas depois começa a chover. E lá vai a Adriana buscar as gabardines, os botins e as galochas. E quem é que gosta de andar de galochas em Maio? Ninguém claro, mas o que há a fazer? Pois, então hoje fiquei pelo meio termo e voltei aos botins. Dizem que vem bom tempo no final da semana. Só acredito se vir! Sempre fui uma grande fã de gabardines. É uma peça super versátil, tanto dá para o Inverno como para dias mais frescos na Primavera, dá para looks mais casuais como para looks mais elaborados e, por isso, para mim é um essencial no meu roupeiro. É daquelas peças que, na minha opinião, vale a pena ter, porque fazem sempre falta. Ora, dado o que referi acima, do tempo estar como está, não tenho saído de casa sem uma, porque apesar da chuva, os dias não estão frios e um trench leve parece-me ideal para dias assim. Outra coisa que ando a gostar muito são as calças rasgadas. Já tenho algumas skinny e agora só preciso de encontrar as perfeitas boyfriend jeans rasgadas. Algumas sugestões onde encontrar umas? Na Zara não está fácil! The weather has been crazy here in Portugal. It's raining almost everyday and we are in May. All this instability gives me bad mood. I don't like rain. First, I'm so absent minded and everytime I leave my house with an umbrella it's almost guaranteed that I will lose it somewhere or I will forget it and then I have to come back to pick it up (even yesterday I lost one), and then it's impossible to think about what to dress in the next day. My closet is half spring half winter right now, so, a big mess. I tried to put some spring clothes there and take away my coats, and boots but then it starts to rain again. So here it goes Adriana pick the trench coats again, and my boots. And who likes to wear boots in May? No one, obviously. I always have been a fan of trench coats. It's a super versatile piece to have in our closet, because, we can use it in the Winter and in more fresh days in Spring. We can wear it with more casual looks or more elaborated ones, and for that reason, it's an essential in my closet. So, since the weather has been like this, I don't leave my house without a trench coat, because although we have rain, the days haven't been cold, so a light trench looks like the perfect piece for days like these. Another thing that I've been really liking is distressed jeans. I already have some skinny ones, but now I'm looking for the perfect pair of boyfriend jeans. Some suggestions where I can find ones? In Zara hasn't been easy! Tens toda a razão, se há peça que mais tenho usado nas últimas semanas é a gabardine e essa cor fica-te mesmo bem, devias usá-la mais vezes. I love the bright color of your trench and your shoes babe... TDF!!!! Look giro ;) adoro a cor da gabardine...o tempo enerva mesmo, eu arrumei os casacos quentesmas até dá vontade de os ir buscar. Such an amazing outfit, pink looks wonderful on you! Linda como sempre! 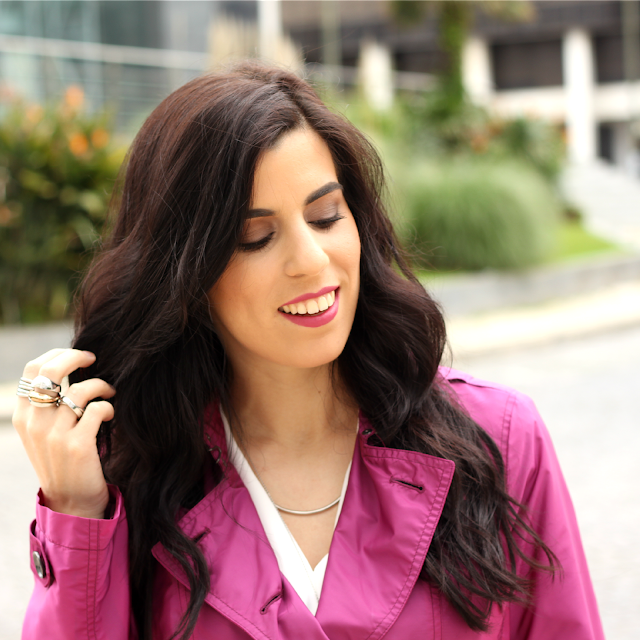 Amo o trench coat! Super chic, and perfect color combination. This pink trench is so cool! Love it! Gira, feminina e prevenida para ultrapassar os dias cinzentos com cor e boa-disposição. Adorei! That trench is amazing! I love the color! Thank you for your visit dear! That sounds like the weather we had in April! It's not a lot of fun, but hopefully the skies will clear soon. You look amazing in this trench coat. sounds like a crazy weather indeed, what we usually have in macau too around march/april. I always lose umbrellas too!! lol anyway one thing good about this weather is to be able to play with clothes... I love (real love) this trench, the color is mad. You may not love the rain, but if you get to wear this gorgeous pink trench, then we're major fans!! I love that pink coat! Gosto do look, mas as 5estrelas vão para o trench coat. Fabulous pink coat, fabulous YOU!!! You are stunning. Love your beautiful Blog! It's been raining a ton here lately too and it also makes me grumpy! Most of my footwear is not suitable for rain. ;) You look very chic in your black and white with the berry colored trench. This trench coat is such a refreshing colour from the usual brown or camel, very pretty! love your bolg I am so glad to have found it, I just started following you on Bloglovin, I would love it if you followed back as well thank you for stopping by my blog. Bad weather always puts me in a bad mood too! Loving your coat and what a gorgeous shade! you look fantastic in pink! This outfit is very well prepared I love the trench coat. Wonderful look, I love the color of the trench it's so cool! You look incredible! The pink trench is fabulous and I LOVE those booties! Well styled! So sorry that you are having rains, hope the weather will get better soon! I love this trench coat on you and this combo of pink, black white and grey is amazing!!! Love it! Love the trench! So cute!! I love that jacket!! Great color!! Que look mais lindo!! Adorei!! Love your trench coat and those shoes- so amazing! adorei o casaco a cor de outono inverno,será que não encontro na zara!! Lovely pink coat. You look sweet and lovely in this good combination of white, black and pink. You look so fashionable.. Nice coat..
Concordo completamente contigo, o tempo está estranho sem dúvida e uma gabardine fica sempre bem e é igualmente para mim uma peça fundamental no armário! Un outfit perfeito. Adorei o teu trench! Que trench tão gira, adoro a cor. :) Boyfriend jeans se calhar só te safas na Levis! Such a cute coat, and I'm absolutely loving those cute booties -- the cut out detail is amazing! LOVE that jacket! So pretty!! Adorei esse casaco, faz-me lembrar uma parka mas com o bónus de ser impermeável. A cor é lindissima e o outfit ficou magnifico!